2008: Good Impressions – the Printmakers’ annual show took place at the Hop (formerly Star) Gallery, and featured general work from sixteen of the artists. 2007: Public House – see the separate page for this show. 2006: Annual Show – General work, took place in Lewes House. 2005: Press Gang – a Christmas show, at the now sadly defunct Thebes Gallery. 2005: Cliffe – the show, at the Town Hall, featured original prints from the group’s second concertina-fold book, a record of many of the shop fronts along the historic lower part of the town. The book’s format was identical to High Street (see below). 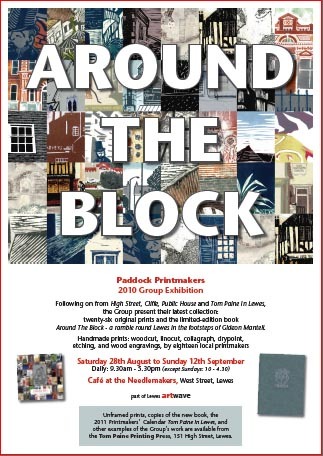 2004: High Street – Paddock Printmakers’ first book portrayed buildings on and around the upper part of Lewes High Street. The book was around 15 feet long, fully extended, and concertina-folded to fit into a titled slipcase. The exhibition took place at Pelham House Hotel, as part of the Artwave festival, and showed all of the handmade original prints that were reproduced in the book.